The new trailer for "The Incredibles 2" is here and it shows Pixar is giving Marvel a run for the money. 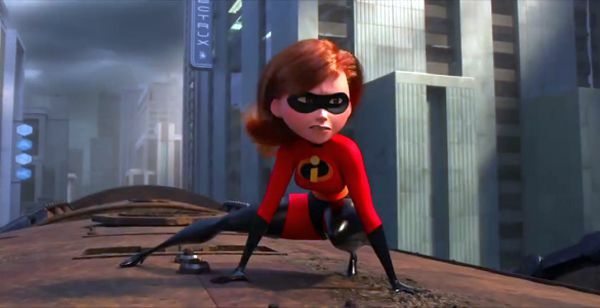 Marvel Studios has the market corners on superhero films right now, but Pixar is gearing up to challenge them in the sequel to the 2004 animated hit film The Incredibles. The new movie picks up where the last one left off with the superhero Parr family facing off against The Underminer. All the Incredibles characters are back. Robert "Bob" Parr a.k.a. Mr. Incredible (Craig T. Nelson is eager to keep crime fighting but there's a twist. Lucius Best (a.k.a. Frozone) (voiced by Samuel L. Jackson) has a mission from Winston Deavor (Bob Odenkirk) who wants to use Helen Parr aka Elastigirl (Holly Hunter) to bring superheroes back and out of hiding. That leaves Bob to become a stay-at-home dad. It's a clever reversal of the plot in the first movie and a fresh twist. Violet Parr (Sarah Vowell) and Dashiell "Dash" Robert Parr (voiced by Huck Milner in the second film) are still getting into trouble and fighting each other. Meanwhile, John Jackson "Jack-Jack" Parr (voiced by Eli Fucile and Maeve Andrews) is manifesting a host of new and unpredictable powers. The movie also brings Brad Bird back to animation. He's been working on live-action films like "Mission: Impossible – Ghost Protocol" and “John Carter." “The Incredibles 2” opens in theaters nationwide June 15, 2018. Watch the trailer below. "In 'Incredibles 2,' Helen (voice of Holly Hunter) is called on to lead a campaign to bring Supers back, while Bob (voice of Craig T. Nelson) navigates the day-to-day heroics of 'normal' life at home with Violet (voice of Sarah Vowell), Dash (voice of Huck Milner) and baby Jack-Jack - whose superpowers are about to be discovered. Their mission is derailed, however, when a new villain emerges with a brilliant and dangerous plot that threatens everything. But the Parrs don’t shy away from a challenge, especially with Frozone (voice of Samuel L. Jackson) by their side. That’s what mkes this family so Incredible."